Every day, our team is inspired by the stories of selfless people who want to make the world a better place. One of our partners, Michelle Gillard, has a great story about what can be accomplished when people put others first in their lives. About a year ago, Michelle discovered the Young Living Foundation’s Sole Hope work when she participated in a shoe cutting party. Sole Hope is an initiative by the Young Living Foundation, and what happens is nothing less than extraordinary. Sole Hope is working in Uganda to rid and remove jiggers (sand fleas) from the feet of men, women, and children. Jiggers burrow into the feet and lay eggs. Over time the eggs multiply and destroy the soft tissue of the feet, and the resulting wounds cause people to become prone to infection and disease, which can be exceedingly dangerous. Millions of people live in poverty around the world. Unfortunately, there are many instances where preventable infections and disease occur because many people in the population of a developing nation can’t afford what many in the United States take for granted, in this case, shoes. Sole Hope seeks to change that with scissors and the dedication of volunteers who host shoe cutting parties and their friends. During these parties, old jeans are used to develop patterns used to create shoes for children who are affected by jiggers in eastern Uganda. 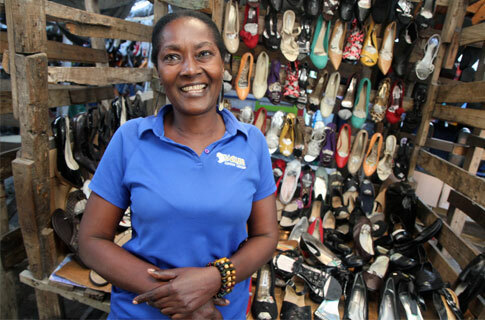 The shoe patterns are then sent to tailors and shoemakers through Sole Hope to create the footwear, which also helps provide people living in Jinja, Uganda with jobs. As Michelle describes the shoe cutting party, the people who attended collected and cut dozens of shoe patterns for a toddler’s size 12 shoe. Michelle explained, “This hit me hard when I received the pattern as it was the same size as my 5-year-old (at the time) daughter, Olivia’s feet. Michelle became emotional because she was deeply touched by the idea that the patterns she was helping to create would make shoes for a child in Uganda whom she might never meet, but was in need. At one point, young Olivia noticed her mother and asked her why she was emotional. Michelle explained what was happening to her daughter. 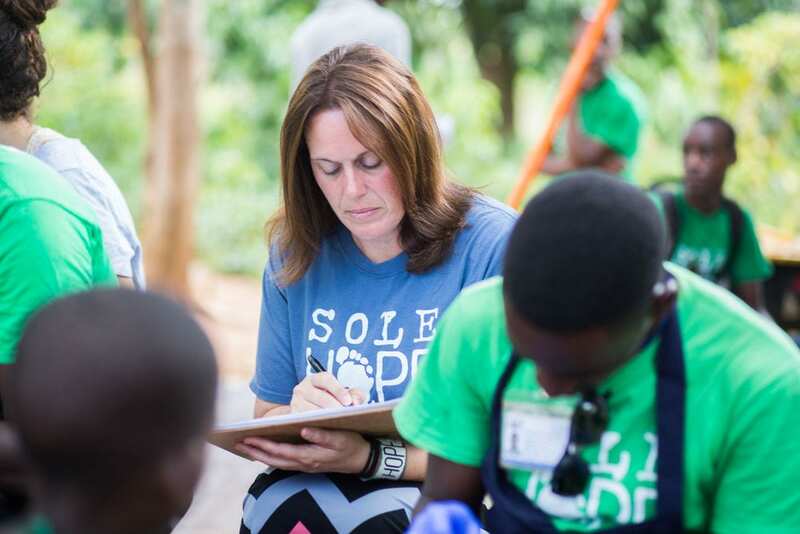 Michelle participated in shoe cutting parties last year that have helped 100 children in Uganda, but she was so captivated by the work of Sole Hope that she had to do more. With the help of others, she also prepared a care kit party fundraiser where 212 care kits were assembled for people living in Uganda. Once workers at UPS became aware that the two large boxes filled with packages were being shipped for people in need in Uganda, they donated their money to send the boxes overseas. Of the hundreds of applications submitted, Michelle was selected to travel to Uganda to work alongside other volunteers to remove jiggers, bathe and care for feet in Uganda, as well as to provide people with shoes and education to help them stay jigger-free. The cost of the trip is $3,500, which covers Michelle’s travel expenses, room and board, as well as food for the journey, which is a lot of money for her family, which consists of her husband Scott, spunky daughter, Olivia, and her two “bonus children,” Tori and Brenden. We wish Michelle great success in her fundraising efforts so she can go on her mission trip to Uganda. It’s people like Michelle that make so much of a difference to make the world a better place.